Mickey Mouse Food Ideas: Mickey & Minnie Treats and Desserts. 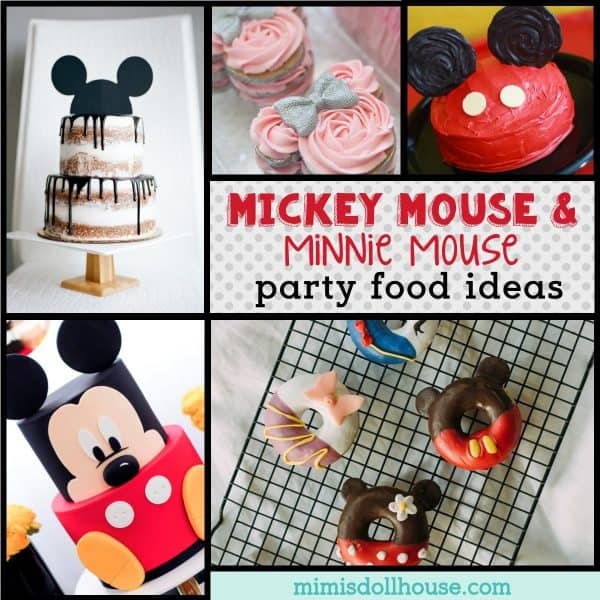 If you are throwing a Mickey Mouse party or decorating for a Minnie Mouse birthday bash, you definitely need some killer Mickey Mouse cake ideas and Minnie Mouse treats! 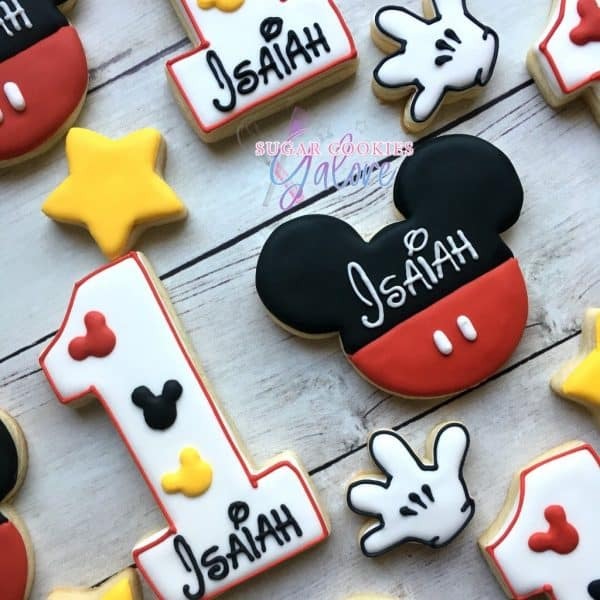 Whether you are baking them yourself or looking for a great place to purchase, we have the best Mickey Mouse food ideas to get you inspired!! 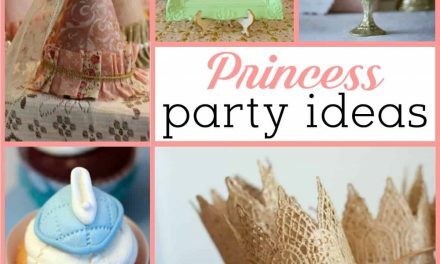 Looking for more Minnie Mouse party ideas? 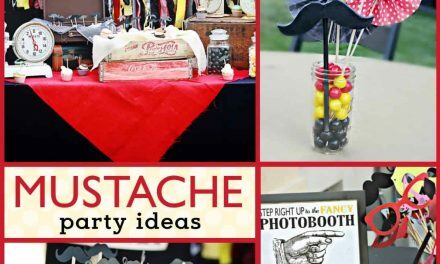 Be sure to check out this Minnie Mouse birthday party, these Minnie Mouse parties, these Mickey Mouse parties, this Mickey Mouse birthday party, and these Mickey Mouse party ideas. Mickey Mouse is an iconic figure. His ears are very distinctive and easily recognized by pretty much everybody, young and old. They are also a super awesome addition to any party. There is no end to the possibilities for capturing Mickey Mouse within the food you serve. 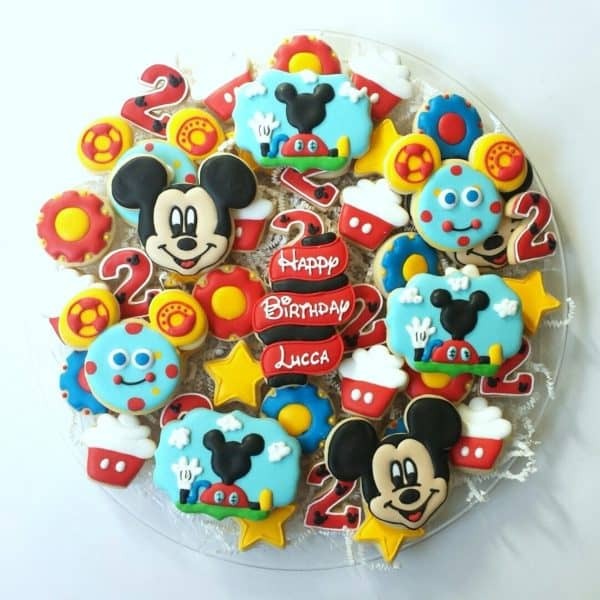 Most of these Mickey Mouse food ideas are pretty easy to make too (I mean the fact that his head is seriously only three circles gives even the most novice party thrower a little advantage). 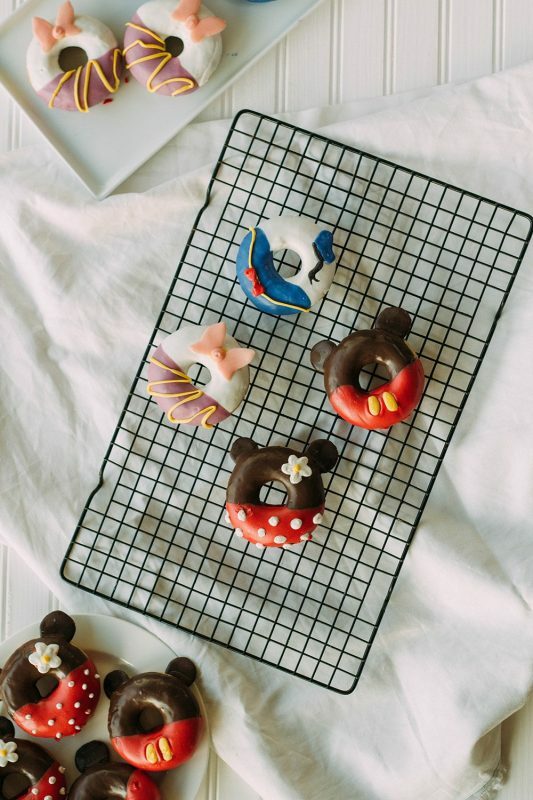 You can make mickey ears with a variety of foods: Oreos, M&M’s, Hershey’s drops, sideways kisses, Rolo’s, peppermint patties…) If you are daring, fondant ears wouldn’t be that difficult either and of course chocolate covered ANYTHING!! Mickey Mouse Cookie Cutters are pretty easy to come by as well and can help you make much more than just cookies. For my 2 yr old’s Mickey Mouse Clubhouse Birthday I used the Mickey Mouse cookie cutters to cut the watermelon and pineapple I served in the fruit tray which gave her “healthy snacks” a little pizzazz. 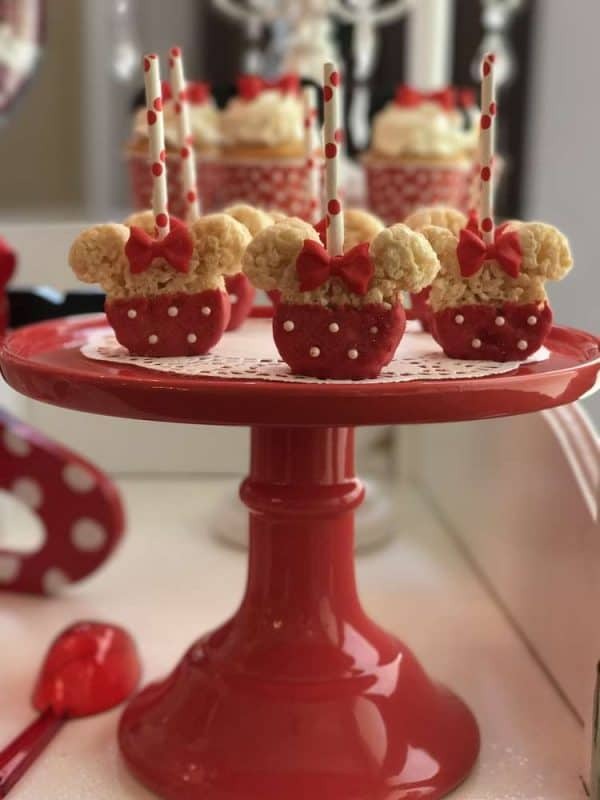 You can also use a simple and inexpensive Mickey Mouse Candy Mold and some chocolate candy melts to make super cute mickey shaped lollipops. To help inspire your creativity, I am sharing some of my favorite Mickey Mouse treats and Minnie Mouse desserts. Some of these ideas are truly amazing!!! Take a look. 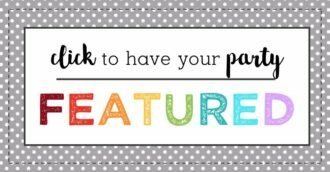 I would love to hear any ideas you have too…leave a comment below!! 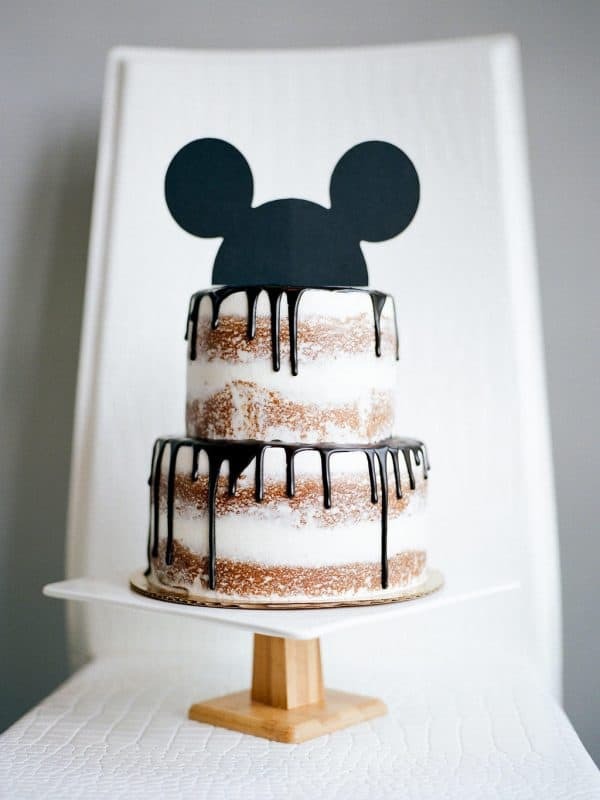 I love this Mickey Mouse cake idea!! Naked cakes are so beautiful and simple and this is perfect for a monochromatic party!! 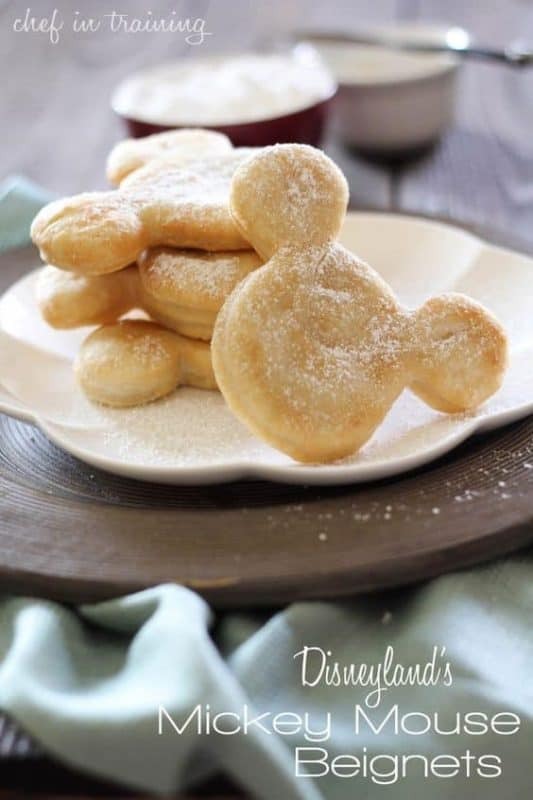 The Mickey Mouse beignets at Disneyland are a favorite of my family…these would definitely be a winner for my girls, as I am sure they would be for all your party guests…yummy!! 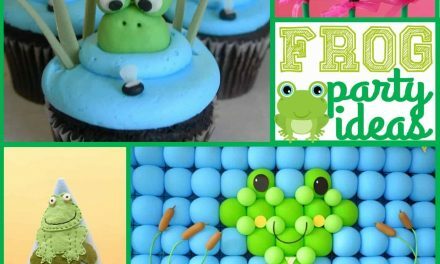 Cake pops are not only fun…they are DELICIOUS!!! These Mickey mouse cake pops are adorable and so cleverly displayed. 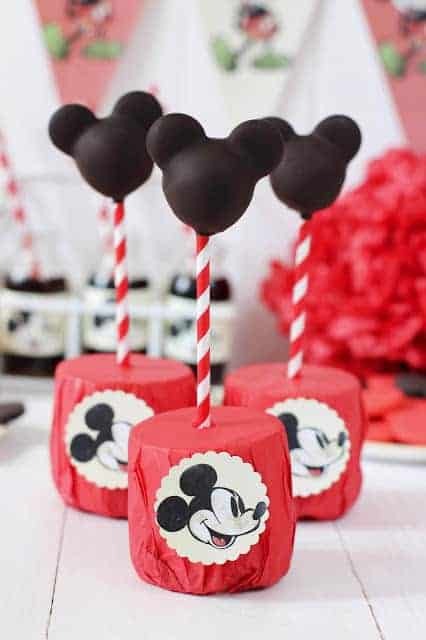 I love everything about this Mickey Mouse treat idea!! 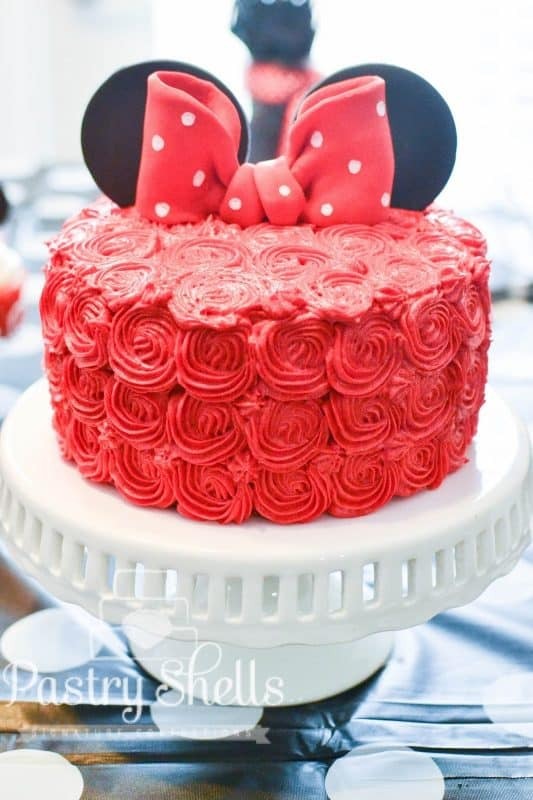 This might be one of my favorite Mickey Mouse cake ideas. 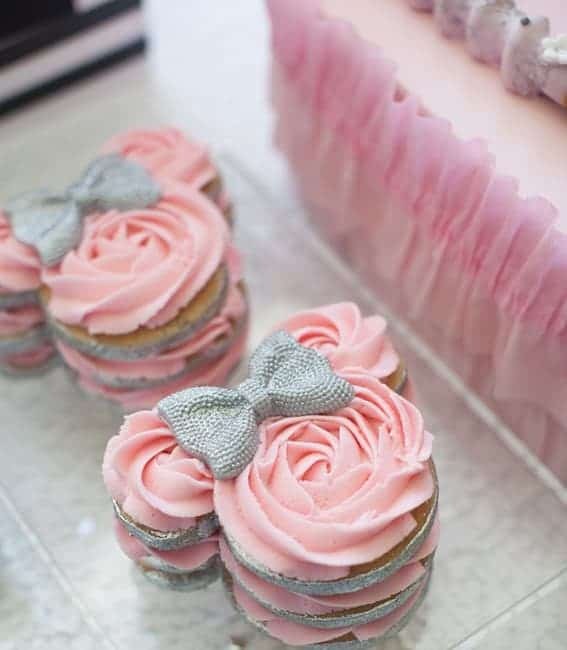 I love the smooth fondant and the adorableness of the design. Winning!!! 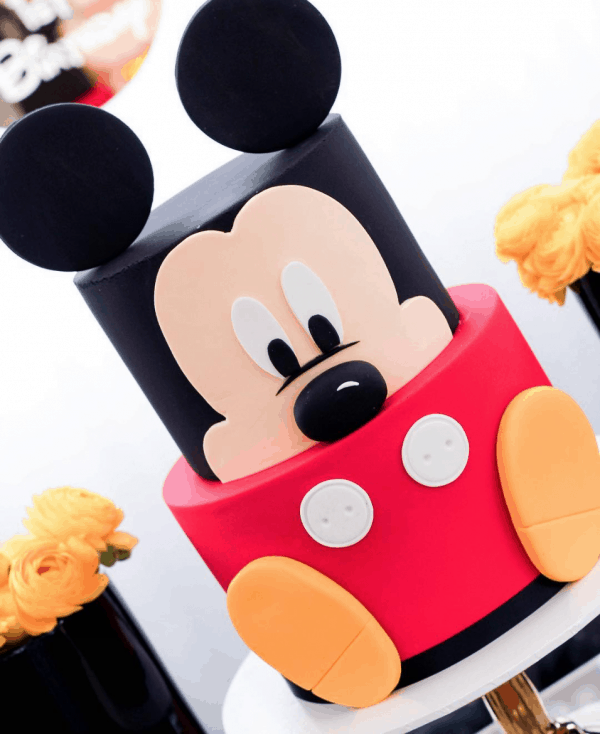 Here is another one of the best Mickey Mouse cake ideas I have seen. I love the simplicity. 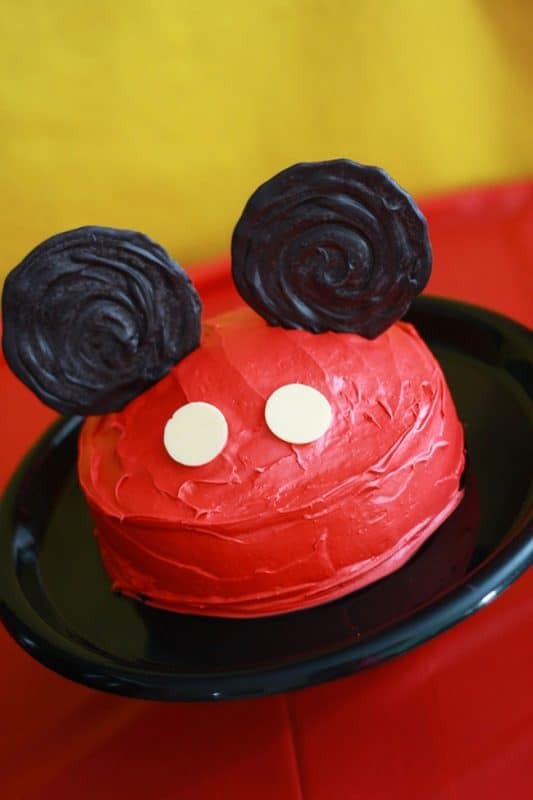 This is an easy DIY Mickey cake, but still adds so much character to the party!! 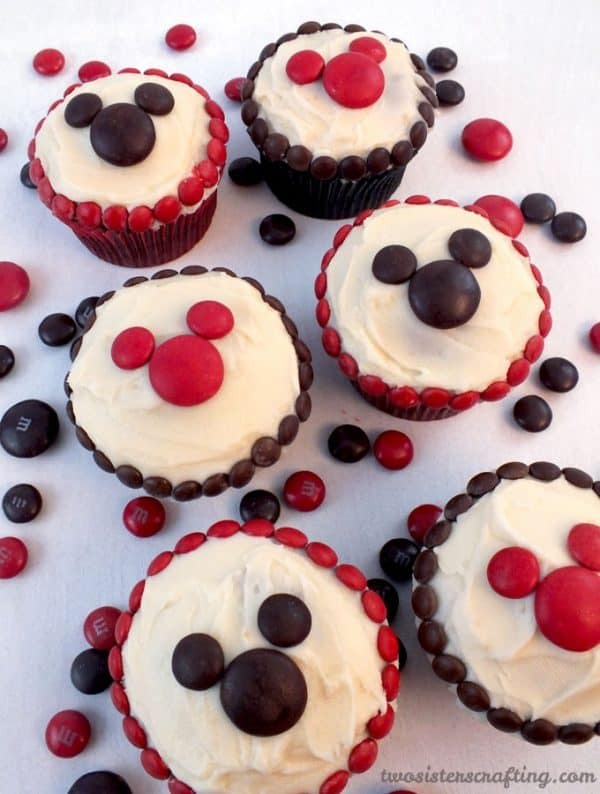 If you can bake a batch of cupcakes, you can make these adorable Mickey Mouse cupcakes. They are simple and charming!! 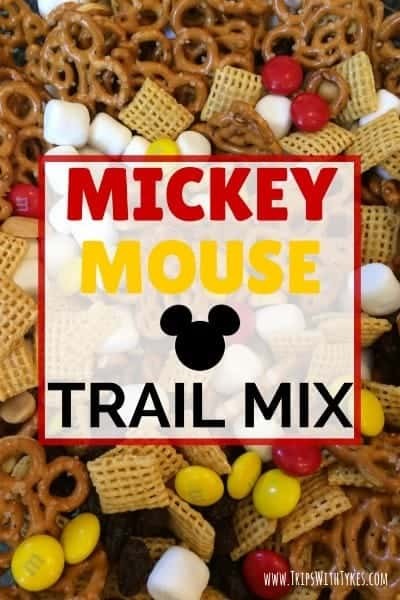 Get your mixing on with some fun Mickey Mouse trail mix. This is yummy and a great salty snack to accompany those sweets!! You can’t forget about the girl behind the Mouse! Mickey’s best gal-pal has some amazing desserts of her own to share!!! 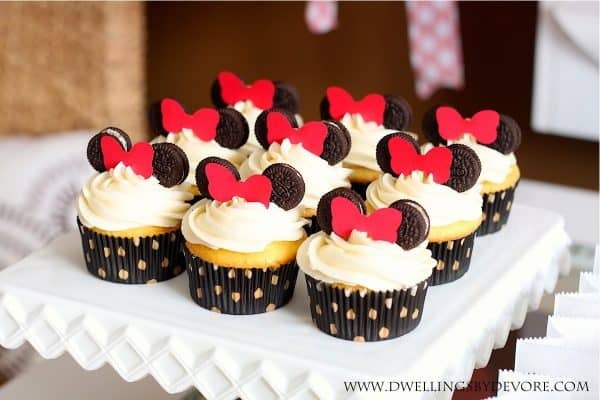 These simple and adorable Minnie Mouse cupcakes are as easy as they are stunning! I love the use of the little Oreos. So simple and beautiful!! Here is a fun Minnie Mouse cake using rosette frosting and a fondant bow and ears. Gorgeous!! Who doesn’t want some Minnie Mouse Rice Krispies treats? 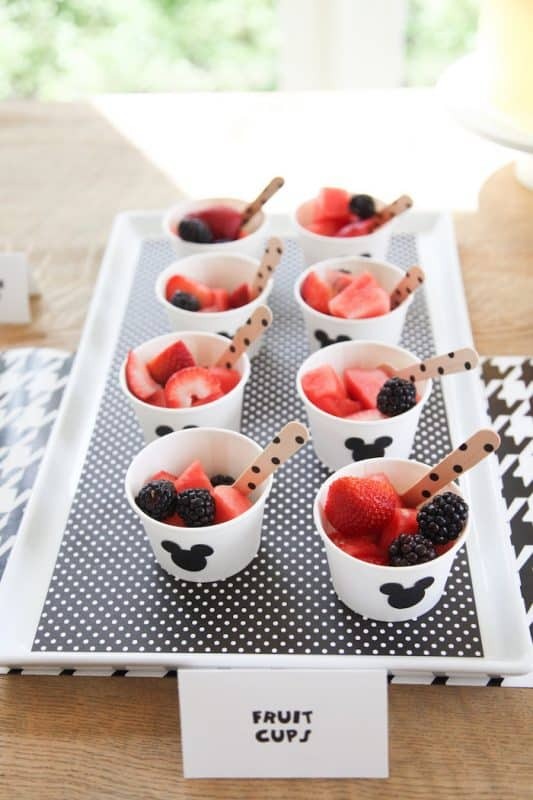 I mean really…these are adorable and so fantastic for a little girls’ Minnie Mouse party!! 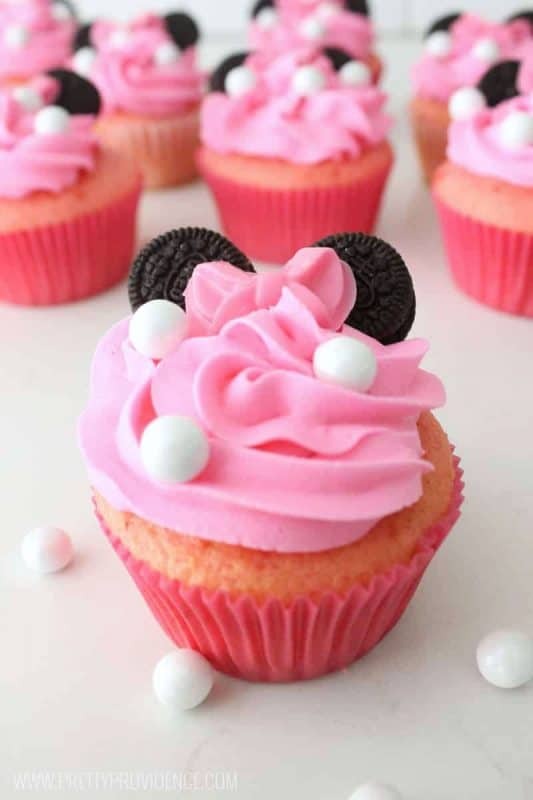 If pink Minnie is your jam, these pink frosted Minnie Mouse Cupcakes are so pretty and so easy to make. I love the sugar pearls on top!! These iced sugar cookies are a dream!! Beautiful and so soft and feminine. This is definitely a fun twist on a classic mouse!! 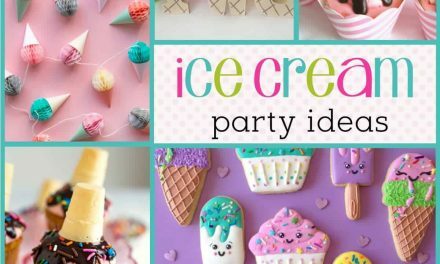 Such cute ideas….do you have any ideas on what to call the food….we are having hot diggity dogs, toodles tea, goofys grapes, le-minnie-ade (lemonade), clarabelles cheese puffs, and plutos pretzels. trying to think of another meat to work in there…..any ideas?